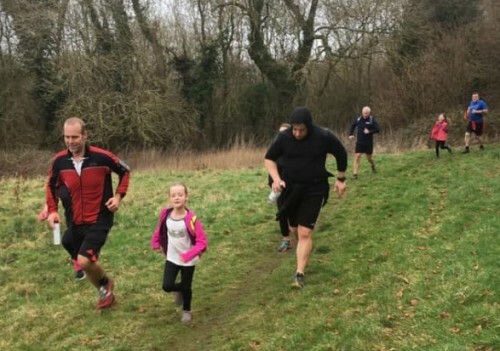 North Wilts Hash House Harriers (NWH3) is a social running and walking club which meets every Sunday for a run or walk in the countryside around Swindon. Runs are typically 5 miles in length, along trails marked in flour, and are cleverly constructed by the 'hare' to allow keen runners to stretch their legs while the majority of us who prefer a leisurely pace can still keep up with the 'pack'. People of all ages and abilities are welcome, and we always have a walking trail as well as the run. Our runs are usually from pubs in the countryside, which is one of the reasons why Hash House Harriers are often referred to as a 'drinking club with a running problem'. But this also reflects the fact that we get up to all manner of social activities which don’t just involve running. In the last few years we have spent weekends in London (a 'Hashopoly'), Bath (a comedy weekend), Ironbridge (culture, history and real ale), Stratford (a Shakespearean weekend) and many others. For our 1666th run we had a great fire of London weekend. Our themed Christmas parties are not to be missed, and the club even has a ukulele group. We regularly collaborate with the many other Hash House Harriers groups around the world. To join us just come along to one of our Sunday runs, usually at 11am in the winter and 6:30pm in the summer, where you can expect a friendly welcome from any of the 'hashers'. We also have a Moonrakers run every fortnight on a Wednesday at 7pm. Hash Accounts Year Ending Dec 2017. See our new Facebook page thanks to Mildred. Rear Entry, our Hash Minstrel has a website. This site is designed and maintained in Fairford by The Graphics Network and KitKat.